While Minibar comes from the U.K., the quartet plays a brand of cosmopolitan roots rock (see Wallflowers and Counting Crows) that is distinctly American. Appropriately, the group relocated to California in 1999. In 1994, Simon Petty formed the group that would become Minibar as a trio that peddled cover tunes (everything from "American Pie" to the whole of Dylan's Blood on the Tracks) in a Soho, London, Tex-Mex restaurant. The first current member added was guitarist Tim Walker in 1995. Bassist Sid Jordan came on board in 1996, while drummer Malcolm Cross joined in 1998. 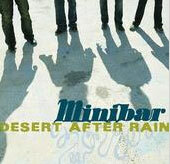 Minibar's debut, Road Movies, produced by T-Bone Burnett, was released on Universal Records in 2001. The 11-song LP features the hook-ridden, poppy songcraft of principal writer and singer Petty wrapped in smooth three-part harmonies and Americana essence.